Streaming data analytics is becoming main-stream (pun intended) in large enterprises as the technology stacks have become more user-friendly to implement. For example, Spark-Streaming connected to an Amazon Kinesis stream is a typical model for real-time analytics. But one area that cannot and should not be overlooked is the need to persist streaming data (unchanged) in a reliable and durable fashion – and to do it with ease. 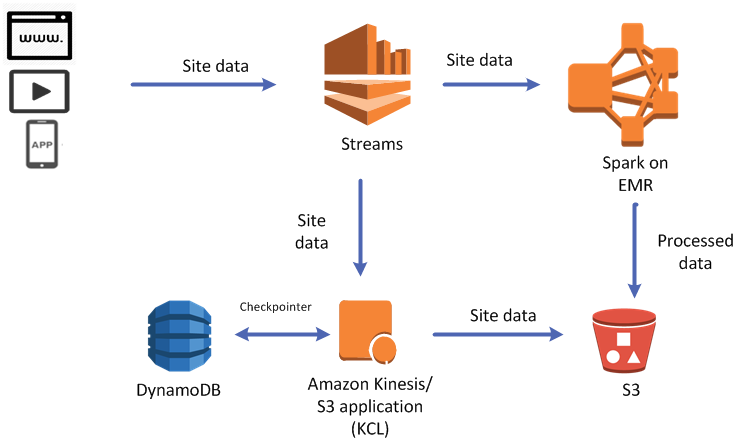 This blog post walks you through a simple and effective way to persist data to Amazon S3 from Amazon Kinesis Streams using AWS Lambda and Amazon Kinesis Firehose, a new managed service from AWS. Here’s a real use case: Hearst Publishing is a global media company behind well-known brands such as Cosmopolitan, Elle, Esquire, Seventeen, and Car and Driver, as well as television and cable entities such as A&E Networks and Esquire Network. Hearst has embarked on the big data journey and needs to collect pertinent data from over 200+ digital sites in real time. This data gives invaluable insight into the usage of their sites and indicates the most relevant trending topics based on content. Using these data points, both historical and in real-time, Hearst could monitor and become much more agile in managing the content available to site users by giving key analytical data to content owners. The KCL has built-in check-pointing for Streams (whether it be TRIM-HORIZON or LATEST). The KCL integrates very easily with the Amazon Kinesis connectors. The Connectors framework provided a way to transform, buffer, filter, and emit the Amazon Kinesis records to S3 with ease (among other specified AWS services).We can buffer data and write to S3 based on thresholds with number of records, time since last flush, or actual data buffer size limits. These features make the KCL–Connector (KCL-C) very powerful and useful; it’s a very popular implementation. The KCL-C setup runs on an EC2 instance or fleet of instances and is easily managed with AWS CloudFormation and Auto Scaling. The KCL has become the proven way to manage getting data off Streams. The figure below shows a sample architecture with KCL. In short, a perfect use case for Firehose and Lambda unfolded. Looking at the needs of the process, reliability was critical along with the ability to buffer (aggregate) data into larger file sizes and persist to S3. The figure below illustrates a sample architecture with Firehose. You need to set up a stream (representing the raw data coming in) and an S3 bucket where the data should reside. For more information, see Step 1: Create a Stream and Create a Bucket. This is where the fun happens. Take a look at the code: If you pulled the GitHub repository, this is located in the Java class com.amazonaws.proserv.lambda.KinesisToFirehose. firehoseEndpointURL – The AWS endpoint where the Firehose delivery stream is hosted. Typically, you keep the Lambda function and delivery stream in the same region. deliveryStreamName – The actual name of the Firehose delivery stream that you are using. deliveryStreamRoleARN – The AWS ARN of the role which you want the Firehose delivery stream to use when writing to S3. You will create this role via the console later in this post. targetBucketARN – The AWS ARN of the bucket to which you want Firehose to write. intervalInSec – A buffer for time lapse. Firehose pushes to S3 if this threshold has been met after the last write. bufferSizeInMB – A buffer for aggregated payload size. Firehose pushes to S3 if this threshold has been met after the last write. This Lambda function is configured to create the Firehose delivery stream if it does not already exist. 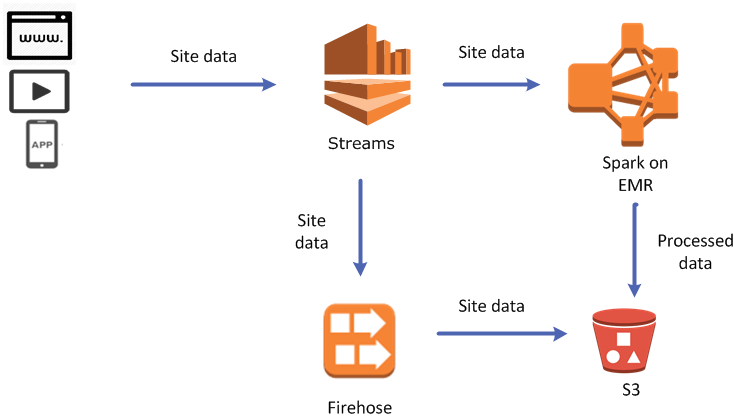 In this post, you create the delivery stream manually from the console, being careful to have the proper private instance variable (above) set in the Lambda function to reflect the Firehose delivery stream thus created. 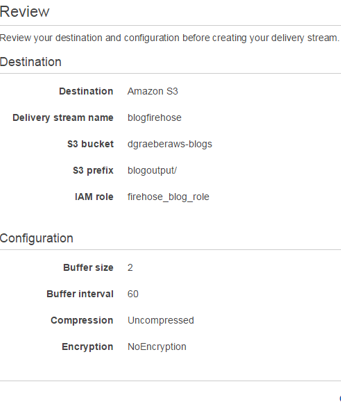 Now, you can create the Firehose delivery stream using the console. For more information, see Amazon Kinesis Firehose Getting Started Guide. In this post, I assume that you do not have a role created that gives you Firehose delivery stream access, so you can create one now. 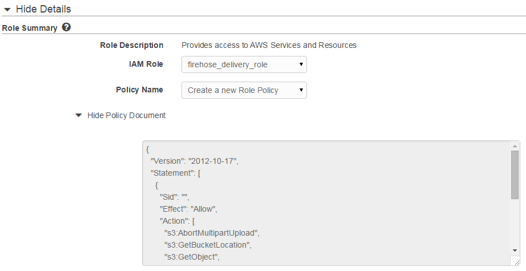 In the list for IAM role*, choose Create new Firehose delivery IAM role. Finish configuring the Firehose delivery stream with the indicated configuration. For this post, set limits of 2 MB and 60 seconds for the buffer size and buffer interval, respectively. NOTE: For this post, you will not be compressing or encrypting the data when writing to S3 from Firehose. Your actual implementation may vary. Verify that your instance variables match between your Lambda function and your newly created Firehose delivery stream. Create the JAR file that Lambda will need. Because this is a Java project with Maven, execute the mvn clean package task from your project root directory. Lambda runs Java 8, so you need to compile against the Java 8 JDK. Now that you have the Lambda code ready to run, create the function itself. You can do this via CLI or console. For more information, see Getting Started: Authoring AWS Lambda Code in Java. Use the role you just created with the policy access to Firehose and Streams and the Lambda trust relationship (directly above). Use the defaults for Memory and Timeout. After the upload, the Lambda function is in place; all you need to do is set the listener. On the Event Sources tab under your new Lambda function, add an event source that is the Amazon Kinesis stream you created earlier. Select a Streams input, add your stream name, and leave the defaults. You are now connected. The only thing left to do is add data to the stream and watch the S3 bucket fill up. In the Java project from Git, a helper class pumps dummy messages to Streams (com.amazonaws.proserv.PopulateKinesisData). If you are running it from your local repository, add your access key information to the resources/AwsCredentials.properties file. If you are running it from EC2, make sure the role on the instance has Streams permissions. After you start adding messages to the stream and the thresholds are hit (2 MB at 60 seconds), you will see your targeted S3 bucket begin to populate with the prefix that you designated and the files written with an object key designating the year, month, day, and hour in which the output file from Firehose was written (prefix/yyyy/mm/dd/hr/*). Aggregated data based on thresholds. Persist data to a durable repository (in this case, S3). The Hearst Publishing use case provided a way to reliably persist data from Streams to S3 with an aggregated output that modeled their current scheme – all with a native AWS service. As the data source was Streams, the Firehose service could run in parallel to the existing real-time data processing scheme with no impact.